On lyrical narratives in contemporary Bulgarian poetry (Translated from Bulgarian by Angela Rodel) | Добре дошли в Бдин! Narrative № 1. The Apollonian. I would like to begin with the clarification that here I am referring to Friedrich Nietzsche’s concept of the Apollonian and the Dionysian in Greek culture as two impulses which are opposed and which mutually interact – and thus move culture forward, similar to the male and the female. This particular duality can be transferred into the field of every culture – and it seems that in this sense we could speak of the specific opposition between Aristotle and Plato, between Goethe and Nietzsche, between Vazov and Botev, between Lyubomir Levchev and Konstantin Pavlov. Yet somehow our idea of “the classic” is always tied to the first calm and balanced representatives of the Apollonian. In my opinion, the anthology Who Is Dreaming My Life? is strongly tied to the Apollonian. What do I mean by this? When speaking of the Apollonian, Nietzsche introduces the concept of the dream vision in counterbalance to Dionysian intoxication. Apollo is the god of all creative forces and at the same time is the god of clairvoyance. He is the god of light, unlike Dionysus, who is associated with darkness. Apollo also rules the beautiful illusion of the inner world of the fantasy. Apollo gave the Greeks the supreme truth, perfection in dream visions in contrast to the not fully fathomable everyday world; he also gave them a deep awareness of nature’s ability to heal and help during sleep. Dreams are simultaneously both a symbolic analogy for prophetic ability and for the arts in general, through which life is made possible and which make life worth living. Yet in the figure of Apollo we must also not lose sight of the thin line that the dream state must not cross over, lest it become pathological; there must always be moderation, absolute freedom from wild emotions, the wise peacefulness of the sculptor-god. Narrative № 2. The Dream Vision. Here a figure emerges that is definitely tied to Vladimir Levchev’s poetry. That is the figure of the dream. Unlike intoxication or ecstasy, the dream is significantly closer to life. And here I am in full agreement with the claim that Vladimir Levchev is not a poet of death, but a poet of life. There is much life and joy in his poems, but it is not everyday life. It is life refined and cleansed by the fragile filter of the dream. There is also much light in the poems, and as we already noted, Apollo is the god of light. Unlike ecstasy and intoxication, which are closer to death and which kill the human body with its own ecstasy, the dream or the dream-vision (I think this latter concept is more precise for these poems, insofar as it is closer to life itself) – on the contrary, they can heal. Here we find an interesting parallel with Pencho Slavejkov (“Dream of Happiness”). Narratve № 3. The Stone. Vladimir Levchev is not a poet of death because he is a poet of eternity. And a symbol of that eternity is the stone. This is another image very characteristic for him (“The Patience of the Stone,” “The Stonemason,” “Bridge,” “Wall,” “The Rock Church near theVillage ofIvanovo”). A curious narrative links the figure of the stone to the figure of the classic. I will mention here in passing that we find such images in Vazov, too – the rocky cliff, granite, the sign; in Pencho Slavejkov, through the metaphor of the “original builder”; in Atanas Dalchev (“Stone”); in Lyubomir Levchev (“When the Power Suddenly Goes Out”). The god Apollo himself is linked to classical Greek sculpture – and from there to the figure of the sculptor, the original builder. But unlike music, which can be enjoyed in the evening and which carries associations with water – that is, tied primarily to the chthonic beginning – sculpture necessarily requires the light of day and in this sense it is definitively linked with the classical era or with a culture’s mature period. Postmodernism is precisely such a period. For me, the figure of the stone is tied to the figure of the erudite scholar. Just as the stonemason constructs his building stone by stone, so does the erudite writer create his book bit by bit. I want to live in such a house! That is, once again we find an association with building, with a house. But I would like to draw our attention to music’s implicit presence in this poetry. Here it is a question of a particular internal rhythm, a selection of alliterations and assonances, which are once again erudite in their essence. Besides from the poetry of T.S. Eliot, Vladimir Levchev also inherited this internal musicality from his father. This musicality is close to the nature of mythology and of dream – and it makes it possible for the erudite poet to mix various lines of various cultures according to the principle of mosaic (the most delicate part of a building) into one common mythological time, the time of the I’s existence here and now. Narrative № 4. The City. That which is characteristic of Vladmir Levchev’s poetry is the spirit of cosmopolitanism. But the spirit of cosmopolitanism is impossible without the tangible presence of a large cosmopolitan city. And here we can emphasize the following lyrical geography:Athens,Sofia,St. Petersburg,Washington, D.C. This is the cultural geography of this book. Only in the space of the big cosmopolitan city can the poet sense and make sense of and express that Babylonian tower of races, cultures and language, but also of times. Because this book speaks not of a city, but of cities, not of a language, but of languages, not of a culture, but of cultures, and not of an era, but of eras. And this is likely the fate of postmodern man. And perhaps this is the spirit of globalization. But cities are also tied to stone, because they are made of stone and inhabited by citizens – a concept which Vladmir Levchev is also fond of. Narrative № 5. The Child. It is astonishing that having wandered through so many cities, cultures, languages and eras in an exceptionally complex biography, Vladimir Levchev has managed to preserve his I, his essence. It seems that the answer to this question might give us yet another figure frequently met in his poetry – the figure of the Child. This is the figure of the human consciousness, which can always step back and view the world in a new and unexpected way. Most probably this figure has forced Vladimir Levchev to return again toBulgaria after a long absence. We wish him a happy return home, since his poetry is a precious stone in the edifice of Bulgarian culture! Let us now turn to a representative of the youngest Bulgarian poetry – Kamelia Spassova and her first collection of poetry, which is already recognized as a highly significant work. Her book misleads us, starting from the very title. Plot No. 17 sounds like a place where there are no distinguishing marks, like a place where a drama of anonymity could play out. Yet in a paradoxical way, precisely this topos creates the lyrical narrator’s identity. The chapbook comes complete with a preface and from the very start gives us several keys with which we can read it. Plot No. 17 is a place where the dead and the just-born meet. As part of an old cemetery, the plot is transformed into a safe hideaway for childhood treasures. From the preface we also find out that the heroine visits that place after many years and the way it has been robbed is an allegory for the pillaging of the adult’s consciousness. But the fact that one rear-view mirror remains turns reality upside-down and becomes the beginning of the book. Thus, the speech in Plot No. 17 unfolds on several levels – between the living and the dead, between children and adults, and between reality and mirror-reflection. Looking back into the past safeguards happiness in the future. But the flipside of this viewpoint can also mean difference. The book’s dedication to “m.k.” gives us another thread to follow, but we will not pursue it here. Let me merely say that the book is exceptionally dialogic, presented like a conversation and even a declaration of love. Thus, the distribution of forces, the way the game is set up in Plot No. 17 is as follows: children, lovers and the dead are on one side, while adults and serious and dangerous people are on the other. The “wondering” child’s gaze in this book can be seen as a chance for a new beginning, as a chance for new enchantment in the disenchanted world of adults. In a paradoxical way, writers such as Kafka and Goethe, who are already dead, who in a metaphorical sense are part of the world cemetery, become more alive than the adults or the serious ones (“to goethe,” “metamorphoses a la Kafka”). Narrative №6. Literature, the book, literacy, the university. Literature, the book, literacy and the university also occupy an important place in this poetry book („footnotes,“ „Another Book,“ „A Brief Apocalypse in the Library,“ „Plot No. 17“). Children and the dead are the well-read ones who gather and study the signs of existence. Literature makes free passage from the world of the dead towards the world of children possible. But life is too multifaceted and complex to be described, to be understood. This is why Kamelia Spassova offers us a poetics that does not give definitive answers, but rather constantly scampers away, runs off, constantly doubts its own completeness, since meaning is the purview of adults (“to goethe,” “crossed out”). Thus, even the very first poem “title” treats the meaning of language ironically. It turns out that the most expensive letters in a person’s life are those chiseled on his headstone, but only poets are interested in them. The frequent change of signs, of identities that the contemporary person is subjected to makes her lose her own identity, to accept majmunitsa or monkey-script*** as her alphabet, yet paradoxically, this very regressing/restarting of the programmed essence returns her once again to the spiritual dimensions of existence (“signs”). Narrative №7. Love. The theme of love occupies an exceptionally important place in this book. The world of adults and dangerous ones is the world of seriousness, the world of the straight-A students, of good work, of heterosexual love, a productive world of stability and monotony („a move“, „Always the Same Thing“). But that, in fact, is the true plot, which suppresses difference, which cannot offer identifying signs to the heroine. Adult scholarship attempts to normalize, to reduce everything to a single understandable common denominator. In its logocentrism, it cannot allow love between children, since this love has no logical explanation, but rather an angelic character („Simple Arithmetic,“ „And Other Such Desires“). Very frequently, besides computers and billboards, those contemporary means of communication, even language, as one of the first advantages of civilization, is the property of the adults, because it has the ability to complicate and falsify the simple and authentic world of children („on watch“, „Billboards“). This is why in the poem „on watch,“ one of the most beautiful examples of contemporary love poetry, the heroine is forced to protect her love from language’s meddling, which could harm its authenticity and pre-linguistic nature. But on the other hand, love can also be linked to language, with mutual reading and writing. In this way, reading the beloved’s texts is transformed into a personal entitling and writing (“chapter I, II, III”). Plot No. 17 sees the child and love as a possibility for renewing and saving the world. This is why in response to the world of the adults and the dangerous ones, the only thing the heroine can do is to take off running and splash in a puddle with both feet (“a move”). Here we noted and analyzed only a part of the lyrical narratives in contemporary Bulgarian poetry, without attempting to be exhaustive, yet with an emphasis on their importance. Let us wish Vladimir Levchev and Kamelia Spassova many more striking poems after these notable books! *Levchev, Vladimir. Who Is Dreaming My Life? 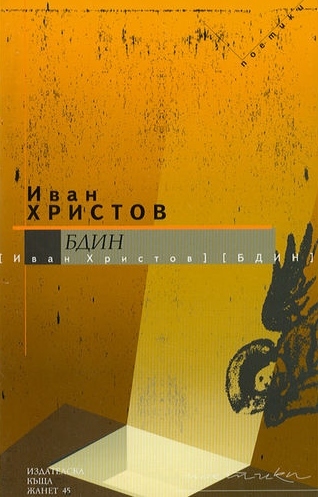 (1977-2007), Zhanet 45 Publishing House,Sofia, 2007. **Spassova, Kamelia. Plot No. 17, Makros Publishing,Plovdiv, 2007. ***Majmunitsa, lit. “monkey script,” is the Bulgarian term for the string of nonsense symbols that occurs when Cyrillic or other scripts are not properly converted.